If you are planning to go back to work after you have your baby, or even think you might, it can be a good idea to plan as much as you can in advance. Here, we will discuss things to consider when you’re planning your return. The more of these things that you can settle in advance of baby making his or her arrival, the more you will be able to focus on caring for your newborn and yourself during whatever parental leave you have. Depending upon what the policies are at your employer and conversations you have had with your boss or supervisor before your leave, you probably have an idea of how long you will be able to stay home with your baby. If it’s possible, though, see if you can get an idea of how flexible those policies are. For instance, if you’re ready to get back to work at 10 weeks or need another month on top of the agreed-upon 12 weeks, are those options available to you? Speak with your boss or your human resources representative and get the policies and their exceptions in writing—email is fine—if you can. Choosing someone else to care for your child is a difficult job for many parents. Depending upon what the childcare market is like in your area, you may have been on the waiting list for childcare centers for months or years, or you may luck into last minute childcare that will be available to coincide with your return to work. If you can, see if you can visit or interview the possible centers and caregivers after your baby is born. Even if you checked out these businesses or interviewed nannies while you were pregnant, it can feel really different to imagine leaving your actual baby somewhere without you. When you visit, meet the specific caregivers your baby would have and talk with the director or owner of the center. Ask questions about what you need to bring for baby in the way of bottles of milk or formula, diapers, wipes, changes of clothes, and lovies from home and what suggestions they’d make to prepare baby for the transition to their care—perhaps about schedules or policies specific to the center. There are a lot of great childcare options out there. It can be tricky, but you will find the right one, whether that’s a large center, a small in-home facility, or a nanny or nanny share in your house. Keep looking until you’re satisfied because if you feel comfortable about the care baby is getting all day, your return to work will go more smoothly. Involve your partner in the decision, if you have one, because then you will feel more confident about your ultimate childcare choices. Before you take parental leave, read your employee handbook and talk with your boss or your human resources representative about the policies around breastfeeding and pumping after your return to work. This Pregistry blog post outlines in detail the legal protections that you can expect at work in the United States, based on the size of your company and the type of work that you do. Generally, employers must provide both time and space for you to pump and store milk, but it’s not always the case. 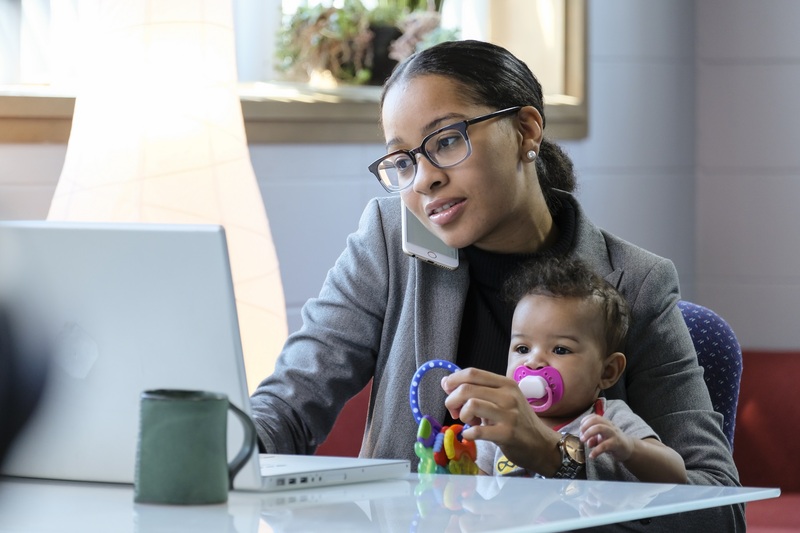 Asking about the policies and engaging your colleagues at work to help you in planning for these needs before your parental leave can make your return to work go that much more smoothly. And don’t forget to check if you qualify for a free breast pump from your health insurance. If your baby breastfeeds exclusively, introduce them to a bottle early, probably when they are somewhere between three and six weeks old. It can be annoying to express milk just so someone else can feed your baby or so that you can feed your baby by bottle. But it’s a great idea to start early and continue feeding baby at least one feed by bottle every day or two, so that you don’t end up with 12-week-old baby who refuses to drink milk from a bottle. A bottle-refusing baby can be a huge stressor when contemplating a return to work, so give yourself and your baby enough time to figure it out together before it’s down to the wire. Paced bottle feeding is a great technique that you and other caregivers can use so that your breastfed baby does not start to prefer the bottle. Plan a loose schedule to get everyone up and out of the house. Enlist your partner’s full participation, especially if you have older kids. If you have time, do a test run one or two mornings before the big day. Pack everything the night before: your lunch and plenty of healthy snacks, cleaned pump parts and pump, empty bottles or bags for milk storage, baby’s bag with whatever they need for childcare, and an extra set of breast pads and a clean shirt for you, just in case. Have it all together by the door, or even put some things in the car if you commute that way. Feel your feelings. Take deep breaths when you need to. Bring along extra tissues and makeup for touchups, in case you cry leaving baby or throughout the day. Have plenty of photos of you and baby together on your phone for when you’re pumping or just when you feel sad. Ease into work. If you can, try to come back for a few half days at first. Or if you’re working full days, try not to schedule too much to fit in. If your days are a little more easeful, you’ll get back into the swing of things faster, which will make your return to work smoother. Schedule something nice for yourself. Maybe it’s a fifteen-minute coffee break or lunch with a work friend. Maybe it’s a pastry you pick up after you drop baby off. Maybe it’s listening to your favorite podcast on your walk in to the office. Whatever you do, remember that it’s okay if it’s hard at first. KellyMom, How much expressed milk will my baby need?